Summertime is when boat owners get out their watercraft and begin spending their days navigating lakes, rivers, and other waterways in Nevada. With the increase in the number of boats out of the water comes a significant increase in the number of boating accidents. Boating accidents can happen for a number of reasons, but some causes are more commonly cited than others. Below is an overview of the five most common causes of boating accidents. Too many boating accidents are caused by negligence. The negligence is often the fault of a boat operator. The operator might not be paying adequate attention to what they are doing or where they are going or might be mistaken about navigation. The water is loaded with hazards that require quick thinking and responsive action. A delay or moment of indecision can result in a serious accident. With more boats on the water during the warmer months of the year, there is a marked increase in the chances of a boating accident and an increase in the number of people who can end up getting hurt. Operating a boat at a high a rate of speed leaves practically no time for a boat operator to react if something happens. The boat might not be able to stop in time or to veer to miss colliding with an obstacle in the water. Colliding with an object in the water at a high rate of speed is just like being involved in an high speed automobile collision. Passengers can be jettisoned from the boat into the water or thrown down on the deck, suffering serious injuries. Victims thrown from the boat could be knocked unconscious and could drown. Operator inexperience is a common cause of boating accidents. Skill in operating a boat comes with time and practice. A novel boater might not be quick to recognize signs of trouble or may lack the experience to make good judgement calls about navigation or may underestimate weather and water conditions. An experienced boater is more likely to recognize potential dangers or water hazards and will know how to avoid them, while a new boater might be unsure how to handle a dangerous or emergency boating situation. Bad weather has been the end of many a ship in the past. A sudden storm or a bad judgement of how quickly a storm is approaching can leave a boat out on the water and vulnerable when the storm begins. Besides being whipped about by the waves and the wind, a boat could be seriously damaged by heavy rain (flooding) or hail. Strong winds make it difficult to control a vessel and heavy rain can make safe and accurate navigation virtually impossible. When an important piece of equipment fails on a boat, it can cause a serious accident. Regular maintenance and inspections should be conducted before every trip out onto the water. If you have been hurt in a boating accident in Nevada, do not delay in getting medical attention and contacting an experienced boat accident lawyer to discuss your case. Please feel free to give our office a call. 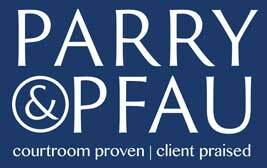 The Parry & Pfau team will gladly schedule a free initial consultation with you. Older PostWhen GPS Directions Land You in an Accident, Who is Liable?